Ever the overachiever, I have already started putting together my annual review. I absolutely love this process. It is so much fun to pull out my trusty notebook, look at my goals for the year, see what was important to me 12 months ago, what I accomplished according to plan, and what went right and wrong. My reviews are elaborate, with spreadsheets and out-year planning and metrics, but remember, I did do a stint as a financial analyst, so these things come naturally to me. If you’d like to do an annual review, but don’t know exactly where to start, nor want to delve into metrics, here are some ideas. Here’s how I do it. Your mileage may vary. Once I’ve picked my word of the year, I then write a short summary of what I want from the year ahead. This is not the place for details, it’s simply your mission statement for your upcoming 12 months. Then, I go into detail on what went right. I start with my career/business, then move to personal. This can be as top line or as detailed as you’d like. I do mine in bullet points, and leave room at the end because I always find a few things I’ve forgotten. And when I do this, everything positive over the past year goes in. It’s a celebration. Next, it time for the sad part — what went wrong. I don’t like this section, but it’s a necessary evil. With the good comes the bad, and vice versa. I use it as a tool to make sure I don’t repeat mistakes, so I can learn and grow from my foibles. I break my goal setting into several parts: work, home, personal, health, financial, spiritual, education. Again, pick which categories work for you. I set about five goals per category, though sometimes, if I’m planning a life change, I use this section to map out what I want my life to look like at the end of 12 months. e.g. : One year, I wanted to make sure I had at least one night a week that was quiet, no TV, to read books by the fire. It seems like a silly goal, but when I started including it in my weekly plan, man, did my contentment levels soar. That’s a word to think about when you’re doing this: contentment. Goal setting should NOT stress you out. Instead, it should give you confidence, clarity, and contentment. The three Cs. Once all my goals are set, it times to turn to the numbers. My word counts are the easiest, because I’ve been using these awesome word trackers for years. 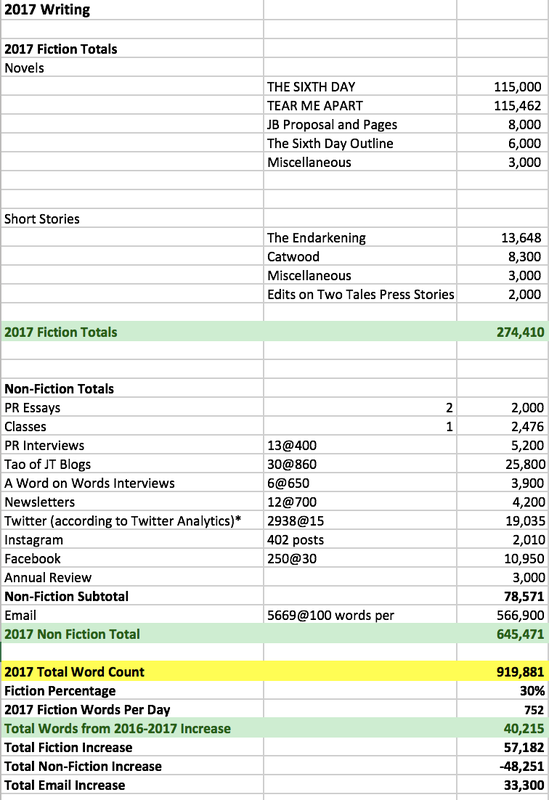 In 2016, I wised up and started two spreadsheets, one for fiction, one for non-fiction, which will make life easier in a couple of weeks. Once I get those numbers in place, I start the breakdown. Fiction speaks for itself, that’s my novels and short stories. Non-Fiction is trickier, that includes everything else, from blogs and essays to email and social media. Those last few aren’t ever completely accurate, but I’ve found an average that I use based on previous years experience. In the chart below, you can see how I do this. For example, I wrote 14 Tao of JT blogs in 2015, and they were approximately 1000 words each. My actual spreadsheets are much messier than this, because I’m pulling metrics from previous years for averages and medians, but you get the idea. Here's my 2015 final chart. For more ideas and insight into how and why I got into this, please see Chris Guillebeau’s wonderful Annual Review on his blog, The Art of Non-Conformity. I’ve adapted his system, and he’s the genius behind all of this. Good luck, and let me know if you end up giving this a try!